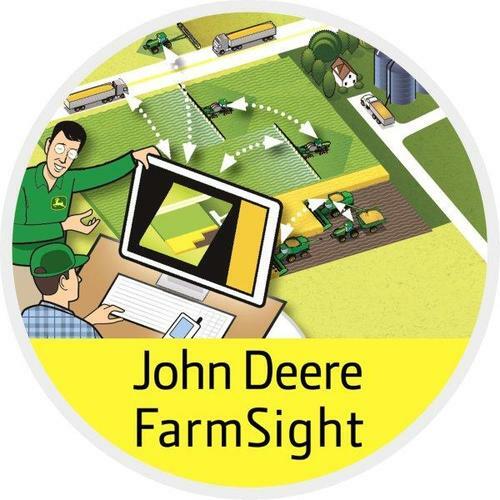 John Deere's newly established FarmSight service packages are now available from participating dealers in the UK and Ireland, and will be featured for the first time in public at Cereals 2013 in June. Customers may choose from four flexible packages each with three optional service levels, designed to help optimise their machinery and farm operations. John Deere FarmSight connects equipment, owners, operators, dealers and agricultural consultants using existing AMS GreenStar wireless technology. It aims to enhance productivity and increase business efficiency by sharing information as well as sustainable practices, to help reduce overall input and running costs and therefore improve profitability. Remote monitoring and service support designed to maximise machine uptime and ensure preventive maintenance, and enable faster repairs. Monitoring of key performance indicators such as fuel consumption on individual machines, in order to maximise efficiency and productivity. Monitoring of multiple machines to increase the efficiency of larger fleets, for example by optimising combine and grain trailer logistics during harvest. Help and advice on making more informed business decisions, to improve productivity and profitability. For example, with the Uptime package, machines equipped with JDLink wireless technology are permanently online' and can be monitored remotely via the internet on a computer, tablet or smartphone. With the customer's permission, the dealer can pro-actively diagnose and optimise machines, help operators to improve their performance, coordinate fleets during harvesting operations, and use field data for better agronomic analysis and more efficient overall management. "Remote diagnosis is saving our customers time and increasing their harvesting productivity," says agricultural service manager Jonathan Hibbert of John Deere's Midlands dealer Farol. "We check error codes on machines regularly using JDLink Service Advisor Remote. During the last harvest season we noticed the speed reading on a customer's combine header reel was low. It wasn't retracting fast enough at the headlands, which was affecting the speed of their harvesting operations, so we sent out a service technician who fixed the reel without the customer even having to call." John Deere is the only agricultural equipment manufacturer to design and engineer its own precision farming technology, so all the FarmSight elements are seamlessly integrated to make them easier to use, and customers have the advantage of only having to deal with one supplier. The new FarmSight dealer service packages can be individually tailored to meet the needs of different customers, and are available in Standard, Premium or Premium Plus levels. They can provide solutions for whole fleets including competitive equipment, particularly relating to machine guidance, ISOBUS controls and telematics.